Box 13.5 x 10.1 cm. ç‰ˆæ¡†13.5 x 10.1å…¬åˆ†,å››å‘¨é›™é‚‰,6è¡Œ16å­—. 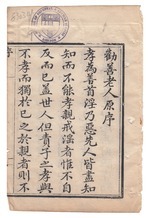 ç‰ˆå¿ƒåˆ†åˆ«é¡Œ"å‹§å­è©©", "æˆ’æ·«è©©", ä¸‹å£é•Œ"æ•¦æ€¡å ‚". From the collection of Robert Morrison, 1782-1834. This item is in the public domain. Please use in accord with Creative Commons license: Attribution-NonCommercial (CC BY-NC). High resolution digital master available from SOAS, University of London - the Digital Library Project Office.